Media Dynamics can take your existing print, live training material or PowerPoint presentation and convert it to a more hands-on interactive web based training tool that can be scaled to meet your needs. We can help develop turnkey eLearning solutions or provide a la carte services from instructional design and scriptwriting to media production and Storyline authoring that is SCORM or AICC compliant. Media Dynamics has successfully helped convert eLearning platforms from conventional desktop based delivery to mobile deployment, including iOS devices, using the Articulate 360 platform. Media Dynamics has the tools and experience to help you standardize the look, feel and functionality across an entire series of training programs. As a mobile learning developer, Media Dynamics can leverage the latest modular development tool in the Articulate Toolbox: Rise 360. With Rise 360, we can build your training application once for any platform or device. Its modular-style integrates all types of media, interactivity and quizzes. Our extensive e-learning development experience allows us to maximize and expand beyond Rise’s built-in functionality with additional features such as complex animation and custom html code blocks. 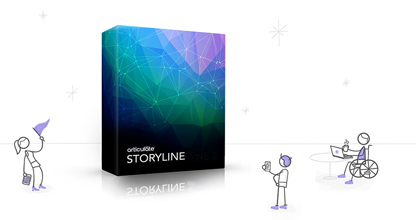 Got a Storyline idea? Contact us to see how Media Dynamics can help turn your vision into interactive reality.